From plain men’s blazers to classic wool jackets, a Henry Herbert jacket is a wardrobe essential when it comes to smartening up an outfit and looking stylish around the clock. 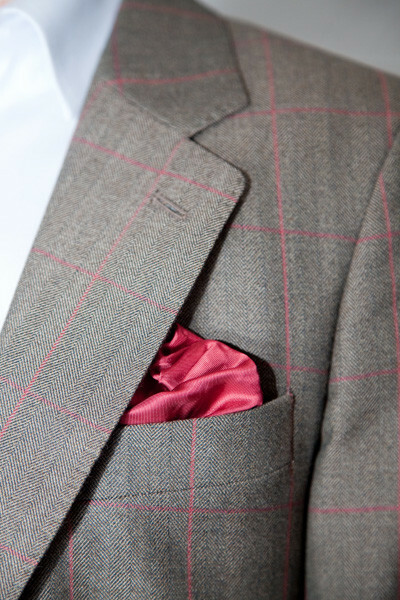 Tailored for a comfortable and stylish fit, our men’s jackets are available in a range of great colours and patterns. And all made to fit you perfectly. 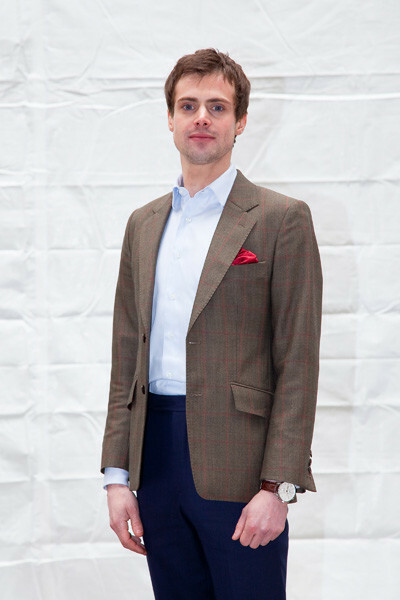 A sharply cut sports jacket from lambswool we have made with a storm collar fastener tucked away behind the lapel. This allows you to button up all the way to the neck when the weather turns the wrong way…..and still look stylish at the same time. 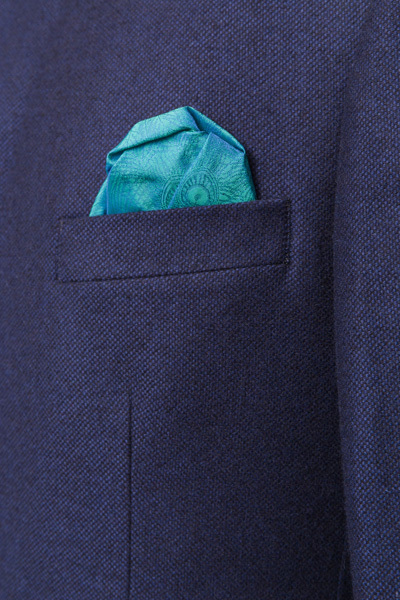 This single breasted two-button jacket is made from a glorious petrol blue herringbone – a colour which suits all seasons and can stand all the elements. 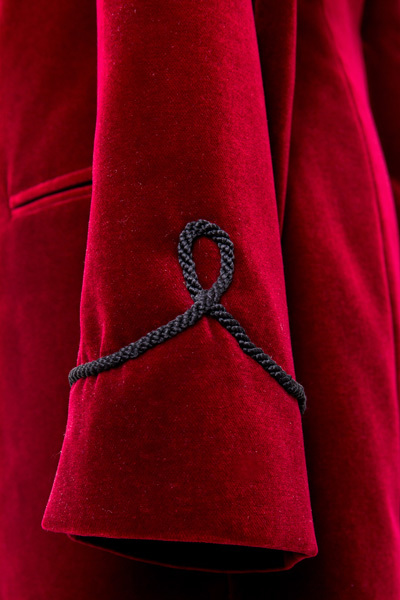 Made from a pure lambswool , this jacket was made and cut in England. As much of it as possible was hand-tailored. A suit such as this takes 8-9 weeks to make, unless you opt for our Express Service. We have a halfway baste fitting and then a forward baste fitting before the suit is finished and delivered. The cloth is from Harrisons of Edinburgh, with horn buttons supplied by Bernstein & Banleys in Southend. Whilst the jacket is a bespoke item which takes 8-10 weeks to make, the shirt can be ordered from our ready to wear shirt collection in collar sizes: 15, 15.5, 16, 16.5 and 17 inches. If you don’t already own a well-fitting sports jacket, it should be the first thing you invest in. Do it right and you’ll look as sharp and dapper as anyone. Just remember: it’s called a sports jacket for a reason—it’s meant for play. It doesn’t need a special occasion, and it doesn’t need to match anything. Made from a wool & cashmere blend from Fox Bros, this jacket was made and cut in England. As much of it as possible was hand-tailored. A suit such as this takes 8-9 weeks to make, unless you opt for our Express Service. We have a halfway baste fitting and then a forward baste fitting before the suit is finished and delivered. 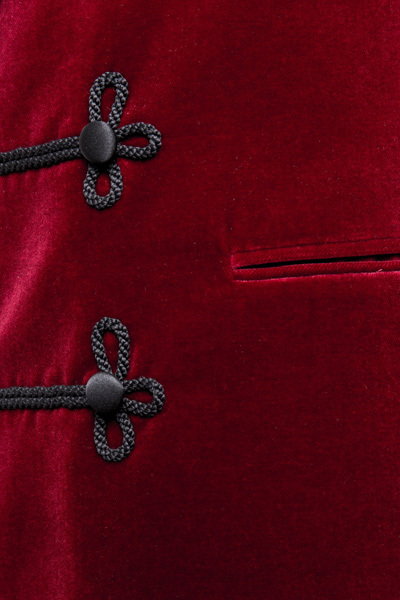 The cloth is from Fox Bros, with horn buttons supplied by Bernstein & Banleys in Southend. 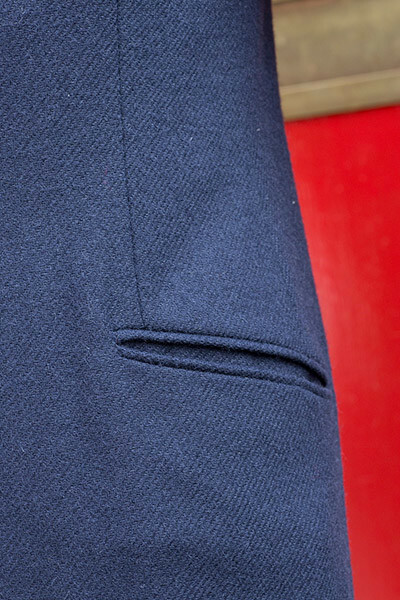 In the past few years, cashmere’s gone from the fabric of kings to something you can get made for yourself. And what better way than asking us to make you one, with the help of our Italian tailoring friends. 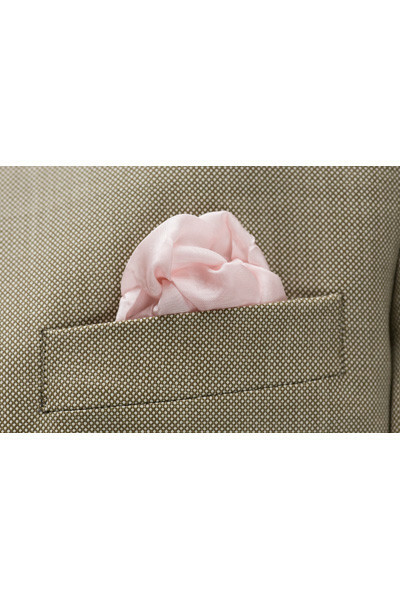 Spun from the finest English spun cashmere, cut in Italy and hand finished and tailored in London – the ultimate Italian Job, with a gentle English finish. Our double breasted cardigans can be made from a range of colours. 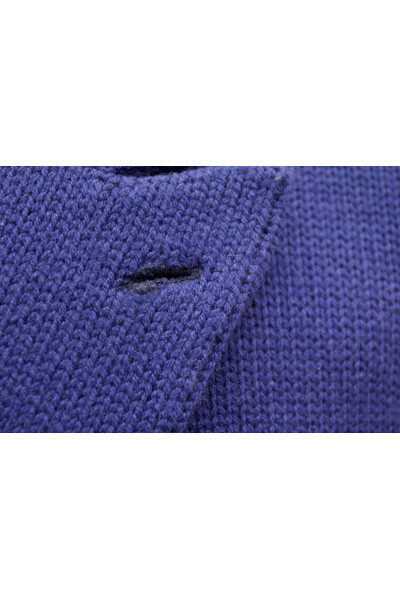 The cardigan can either be single breasted or single breasted, in heavy or light weight wool. It is cut in Italy and finished and tailored in London. 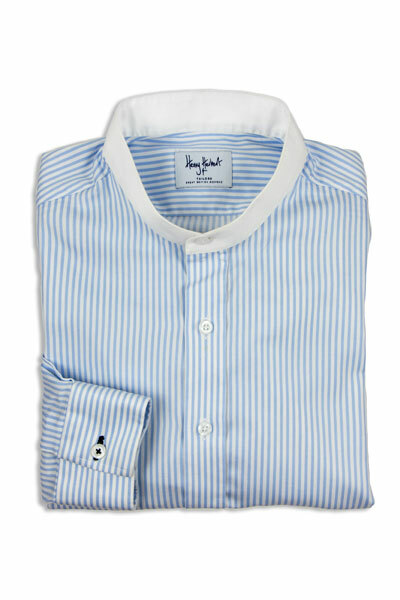 Just contact a Henry Herbert tailor for more information. 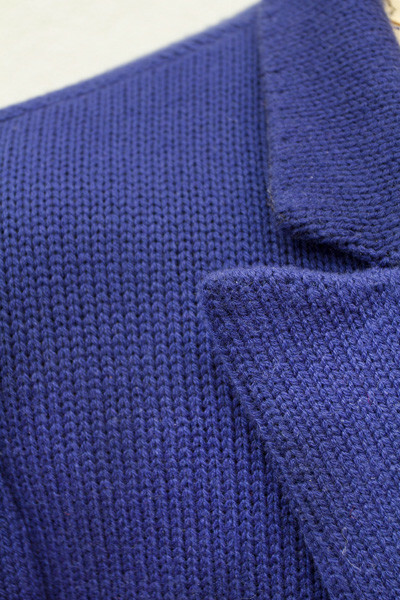 The cardigans take about six weeks to make, with a number of fittings along the way. A single-breasted, lapel-less jacket that is buttoned high to a banded collar. It is named after former Indian prime minister Mr Jawaharlal Nehru and his style continues to live on today. 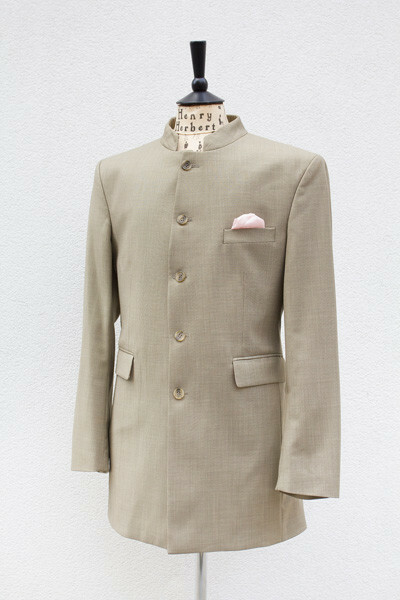 The trademarks of Nehru tailoring can be seen on the jackets we make today suit, including the tunic collar sleeve, breast pocket for pocket handkerchief and a narrow, slimline finish. 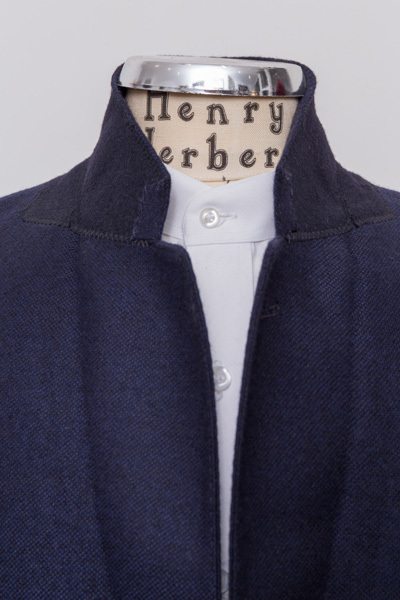 Made from an lightweight wool/silk blend, our Nehru jackets are cut and made in England. As much of the jacket as possible is hand tailored. As with every jacket we make, unless you choose our Express service, the jacket will take 8-9 weeks to make – we have a half way baste fitting and then a forward baste fitting before the jacket is finished and delivered. 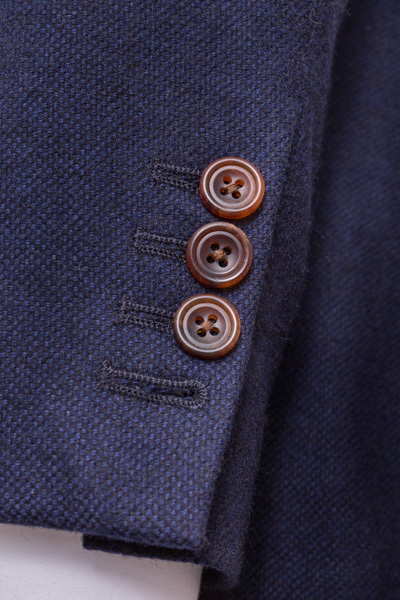 Note how there is no lapel, but a narrow band of buttons fastening the jacket together. 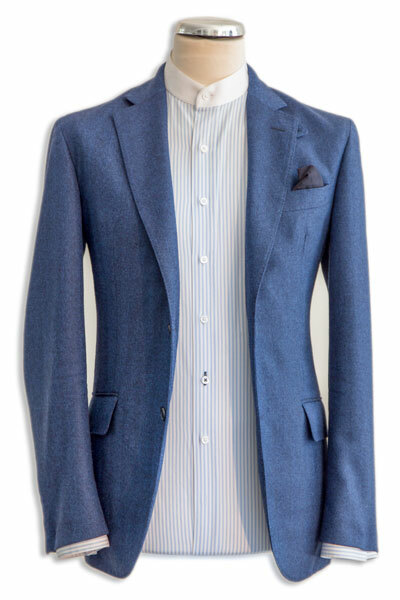 This is gently tailored together to give a slim line, fitted finish to the jacket. A sports jacket isn’t a suit, so don’t treat it like one. A plaid shirt, purple sweater, anything from khakis to jeans—it all works. If you’re uncertain, compose the outfit on your bed until you get it right. 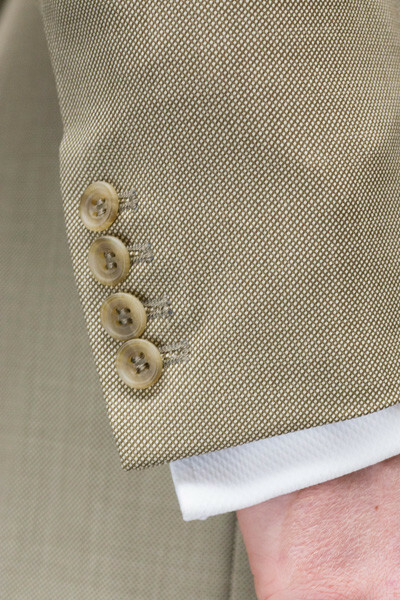 If you’re looking for understated elegance, pare things down with black, silver, or mirrored buttons. 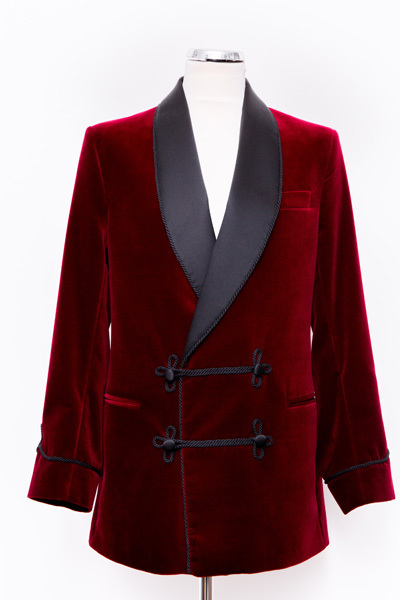 You can take this jacket from the office to dinner and then to the after-hours bar without changing a thing. Made with a canvass, the jacket is made and cut in England. 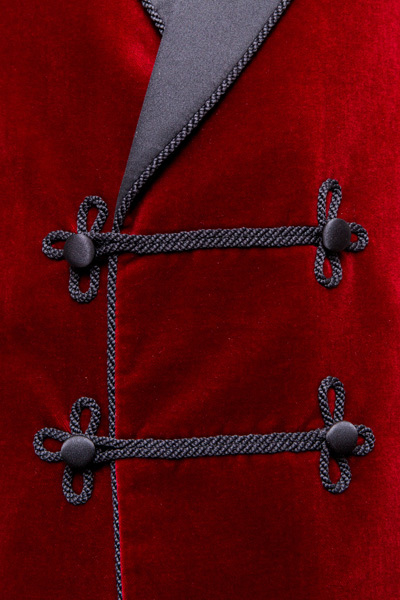 As much of the jacket as possible is hand tailored. As with every jacket we make, unless you choose our Express service, the jacket will take 8-9 weeks to make – we have a half way baste fitting and then a forward baste fitting before the jacket is finished and delivered. The cloth was from Holland & Sherry and the lining from Dugdales in Huddersfield. 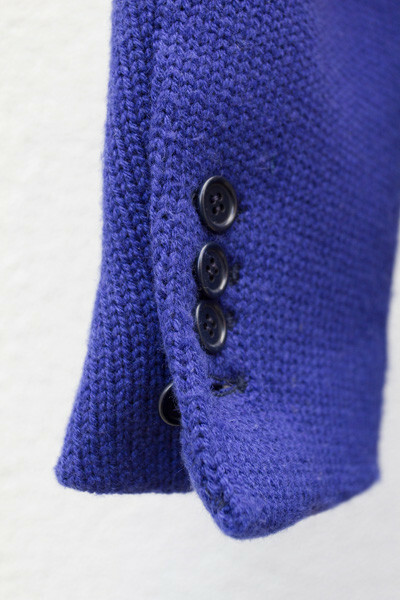 The cloth is 100% wool with working buttons and working cuffs. See also: bespoke sports jacket, custom sports jacket, mens blazers, Sports Jacket. The Nehru suit is never out of style. It’s a sleek, modern look that seems appropriate in today’s tieless world. 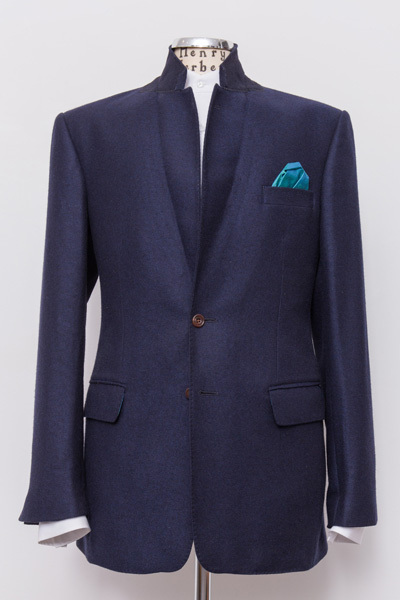 Since this jacket shows virtually nothing else, it’s important that it be well tailored and fit impeccably. You could wear a banded collar, but the classic accompaniment to a Nehru suit is a turtleneck. No tie is necessary. Forget the bolo. Save it for your Nudie suit. 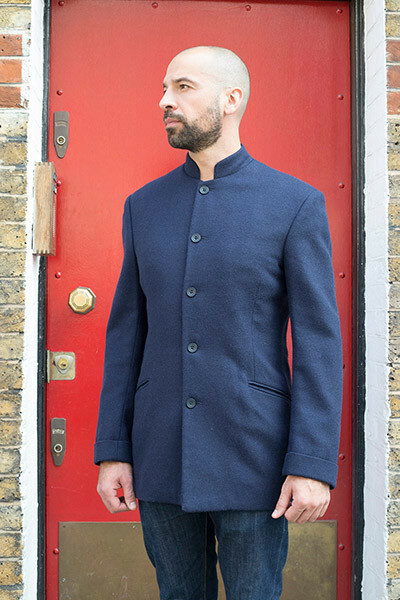 Made from a heavy ‘boiled’ wool, the jacket was made and cut in England. As much of the jacket as possible is hand tailored. As with every jacket we make, unless you choose our Express service, the jacket will take 8-9 weeks to make – we have a half way baste fitting and then a forward baste fitting before the jacket is finished and delivered. The cloth was from an English mill near Bradford and the jacket was made with rolled cuffs. If you don’t already own a well-fitting sports jacket, it should be the first thing you next think of. Play it right and you’ll look as sharp as Don Draper. But what should you look out for? It’s called a sports jacket for a reason. You can dress it up, but it’s meant to be played in. Hard. That means throwing it on the backseat of your car or cramming it in your backpack once you’ve peeled it off. It doesn’t need an occasion, and it doesn’t need to match anything. It just needs to be worn. See also: bespoke tailors, casual mens blazer, tweed jacket, tweed sports jacket. 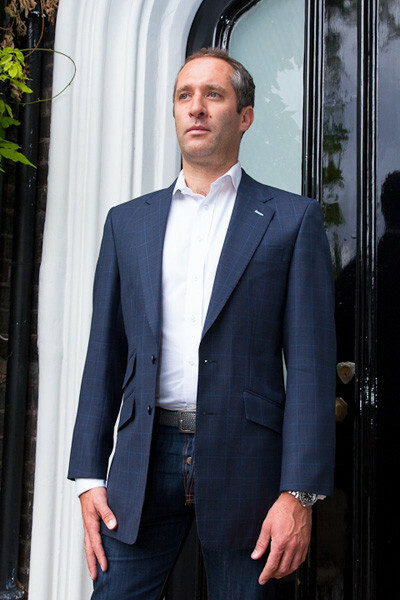 Bespoke Tweed Sports Jackets & Linen Casual Sports Jackets, Savile Row. 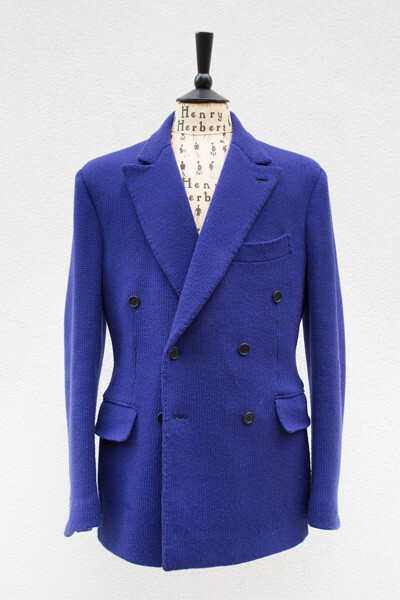 Henry Herbert Bespoke Tailors make slim cut and stylish tweed and linen sports jacket, ideal for casual wear. Try mixing with a crisp white bespoke shirt, for a refreshing bespoke tweed or linen sports jacket finish.